Battling Harvick for the lead on the final restart, Kraus’ Toyota pushed Harvick up the track in Turn 4 and knocked the hottest driver in the Monster Energy NASCAR Cup Series out of contention. Harvick slide back to ninth, while Kraus’ teammate, Cole Rouse, took the lead in that melee. But Rouse eventually ceded it to Kraus in lapped traffic on Lap 159. Harvick spent the past week championing grass roots, short track racing and his entry in the Bakersfield 175 helped pack the grandstands Thursday night. And all signs pointed to a happy Harvick homecoming as he started from the pole and led the first 132 laps. When asked if he was surprised about the final restart, Harvick said he “was surprised I got run over” but thanked the fans who came out for the 2018 K&N Pro Series West season opener. For Kraus, he started his 2018 right where he left off last year: In Victory Lane at Kern. The 16-year-old from Stratford, Wisconsin, capped his 2017 Sunoco Rookie of the Year campaign with his first career series’ win in the finale, and looked ready to assume the mantle of the No. 16 NAPA Auto Parts Toyota. 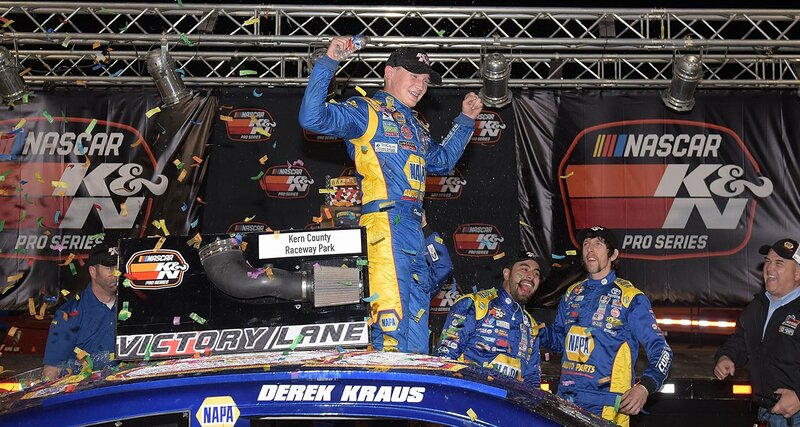 Kraus moved into the ride vacated by two-time series champion Todd Gilliland, who has moved up to the national series. Derek Thorn finished second, followed by Rouse. Without a caution in the closing laps to close the field, Harvick was only able to get back to fourth at the finish. Ryan Partridge rounded out the top five, setting the stage for what looks like a year-long battle between Bob Bruncati’s Sunrise Ford team with Thorn and Partridge, and the Bill McAnally Racing stable that saw Kraus and Rouse running up front. In fact, Bruncati’s third car of Trevor Huddleston finished sixth, while BMR’s Hailie Deegan was seventh in her series debut. Fellow rookies Austin Herzog, Rod Johnson Jr. and Reid Lanpher followed to round out the top 10. Fans can watch all of the action at 11 p.m. ET, March 20 on NBCSN. The NASCAR K&N Pro Series West returns to the track on Saturday, May 5 with twin 100-lap features at Arizona’s Tucson Speedway. races on track during the NASCAR K&N Pro Series West Bakersfield 175 presented by NAPA Auto Parts at Kern County Raceway Park on March 15, 2018 in Bakersfield, California. Note: Until this event, Kevin Harvick won he last 4 races, in a row.